Hospital disinfectant products are used to kill or eliminate harmful agents such as virus, bacteria, and fungi from an equipment, floor, or patient’s skin and body. The use of hospital disinfectant products in hospitals is common in making human and non-living objects germ free. With increasing awareness about the safety of patients, the process of sterilization is set high on priority by healthcare professionals. Rising number of surgical procedures and nosocomial infections (hospital acquired infection) propels the demand for sterilization equipment. All these factors are expected to drive the overall hospital disinfectant market across the world during the forecast period. The global hospital disinfectant products market has been segmented based on type, application, and geography. Based on type, the market has been classified into liquid, gel & lotions, spray & foam, wipes, devices, surveillance providers, and others. Based on application, the market is segmented into skincare, surface cleaners, air cleaners, water cleaners, disinfectant instrument & accessories, and surveillance providers. In terms of skincare, the market is further sub segmented into skin cleanser, hand sanitizer, surgical scrubs, skin conditioners, and others. The surface cleanser segment has been sub segmented into toilet cleaners, floor cleaners, surface sanitizers, and instrument decontaminant solution. Based on air cleaner segment, the market is classified into air neutralizer and air freshener. In term of water cleaner, the market has been sub segmented into water disinfectant solution and water purification products. In term of disinfectant instrument & accessories, the market is sub segmented into hand sanitizer dispenser, UV disinfectant, fogger disinfectant, air purifier, water sterilizer, and others. In term of surveillance providers, the market is categorized into antimicrobial stewardship, infection prevention, and others. Based on type, the liquid segment is expected to be the fastest growing during the forecast period in the hospital disinfectant products market. Liquid based products are the oldest form of hospital disinfectants and include liquid based disinfectant products such as skincare cleaner, surface cleaner, air cleaner, and water cleaner. All these are expected to drive the liquid segment during the forecast period. 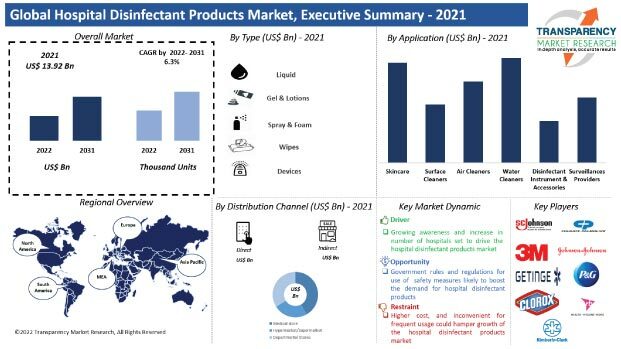 In addition, rapid product innovations and new product launches are the key factors which are expected to accelerate the hospital disinfectant products market across North America, Europe, Middle East & Africa, South America, and Asia Pacific during the forecast period. Based on application, the market is segmented into skincare, surface cleaners, air cleaners, water cleaners, disinfectant, instrument & accessories, and surveillance providers. The surface cleaner segment held major share in 2017, and is expected to maintain its share during the forecast period. The skin cleaner segment is expected to have a healthier growth rate over the forecast period. In terms of skin care, the hospital disinfectant market has been further sub segmented into skin cleanser, hand sanitizer, surgical scrubs, skin conditioners and others. Under the skin care segment, the hand sanitizer segment is expected to be the most attractive segment. In hospitals, doctors and other health professionals frequently use hand sanitizers for sanitation purposes. Thus, an increase in total health expenditure generally has a positive effect on industry demand and revenue. Hand sanitizer is the basic hospital disinfectant product. Based on surface cleaner, the market is sub segmented into toilet cleaners, floor cleaners, surface sanitizer, and instrument decontaminant solution. Toilet cleaner and instrument decontaminant solution is expected to be the most attractive segment during the forecast period. Increase in number of hospital-acquired infections is anticipated to drive this segment of the market. Under the air cleaner segment, air freshener is expected to be the most attractive segment during the forecast period. In term of CAGR the air freshener segment is expected to be the fastest growing segment. As compared to air neutralizer, air freshener is less expensive. Air freshener products are used to reduce the odor in the air. Air fresheners are available in different forms such as spray, gel, and liquid. Based on water cleaner, the water purification segment is anticipated to grow at the fastest rate during the forecast period. This is mainly due to the robust growth of the hospital sector in developing markets, and increasing hygiene concerns in hospitals across the world, which is expected to drive the overall market during the forecast period. Under the disinfectant instrument & accessories segment, hand sanitizer dispenser segment is projected to be the most attractive segment during the forecast period. Increase in the number of minimally invasive surgeries is expected to boost the hospital disinfectant products market during the forecast period. Rise in number of surgeries would require extensive use of medical instruments, and consequently the disinfection with latest technology of sterilizers. Under the surveillance provider segment, infection prevention is expected to be the most attractive segment during the forecast period. In terms of CAGR, infection prevention is expected to be the fastest growing segment. Hospitals are increasing adopting infection surveillance software in order to control and minimize hospital associated infections in real-time. These factors are expected to accelerate the overall surveillance provider segment during the forecast period. The hospital disinfectant products market is fragmented due to the presence of several players. Competition is expected to intensify in the coming years, due to the entry of several local players. Key companies profiled in the research report who offer products, devices, and surveillances products include Colgate-Palmolive Company, Contec Inc., Becton, Dickinson And Company, Ecolab Inc., Georgia-Pacific LLC, GOJO Industries, Inc., Henry Schein Inc., Johnson & Johnson, Kimberly-Clark Corporation, Reckitt Benckiser plc., S. C. Johnson & Son, Inc., The Clorox Company, The Procter & Gamble Company, 3M Company, Belimed AG, Getinge AB, SAKURA SI Co. Ltd, Steelco S.p.A., STERIS PLC, Terragene S.A., Tuttnauer, Atlas Medical Software, Baxter International Inc., Premier, Inc., Quantros, Inc., RL Solutions, Truven Health Analytics Inc., VigiLanz Corporation, and Wolters Kluwer N.V. The report on the hospital disinfectant products market provides analysis for the period 2016–2026, wherein the period from 2018 to 2026 is the forecast period and 2017 is the base year. The report covers all the major trends and key drivers playing a major role in the growth of the hospital disinfectant products market over the forecast period. It also highlights the drivers, restraints, and opportunities expected to influence the market’s growth during the said period. The study provides a holistic perspective on the growth of the hospital disinfectant product market throughout the above mentioned forecast period in terms of revenue (in US$ Mn) and volume (in Thousand Units), across different geographies such as Asia Pacific, South America, North America, Europe, and Middle East & Africa (MEA).